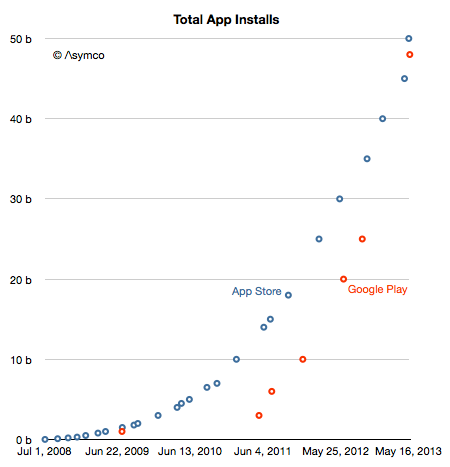 By the end of May there will be 100 billion mobile apps installed on iOS and Android devices. Not bad for a five year old medium. Although discussions related to how Apple will “use its cash” center on acquisitions of companies, Apple’s has been busy acquiring, just not companies. It has been buying capital equipment. Capital meaning (in the original sense of the word) the means of production. 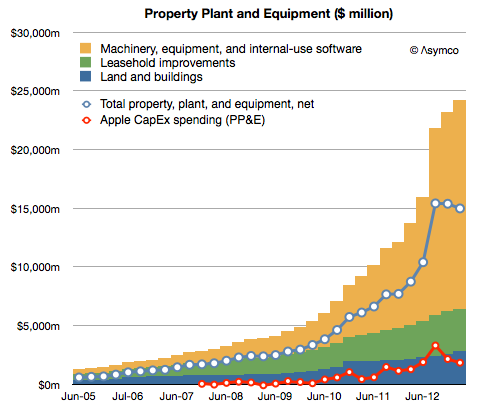 Since the launch of the iPhone Apple has spent $21.1 billion on the acquisition of property, plant and equipment. The company has already stated that they will spend another $10 billion or so for the current fiscal year. This has been mostly machinery and equipment used in manufacturing. We haven’t so far. That doesn’t shut off the future. Why? It takes a lot of really hard work to do a phone right when you manage the hardware and software and services in it. We’ve chosen to put our energy on doing that right. We haven’t been focused on working multiple lines. Think about the evolution of the iPod over time. The shuffle didn’t have the same functionality as other products. It was a really good product, but it played a different role — it was great for some customers it was strikingly different than other iPods. The mini played a different role than the classic did. If you remember when we brought out the mini people said we’d never sell any. It was too expensive and had too little storage. The mini proved that people want something lighter, thinner, smaller. My only point is that these products all served a different person, a different type, a different need. For the phone that is the question. Are we now at a point that we need to do that? At a macro level, a large screen today comes with a lot of tradeoffs. When you look at the size, but they also look at things like do the photos show the proper color? The white balance, the reflectivity, battery life. The longevity of the display. There are a bunch of things that are very important. What our customers want is for us to weigh those and come out with a decision. At this point we think the Retina display is the best. In a hypothetical world where those tradeoffs didn’t exist, you could see a bigger screen as a differentiator. Full interview here, answer begins around minute 37. Questions for Tim Cook; a brief look at the grammar of the organization; Xbox One vs. the Spruce Goose and how to avoid knowing too much. 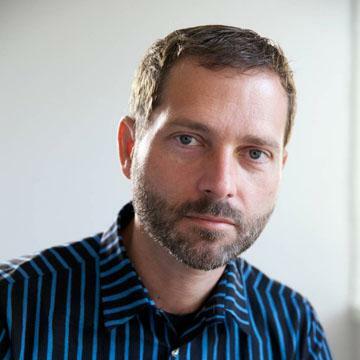 via 5by5 | The Critical Path #86: Staying Foolish. Next week at AllThingsD’s D11 conference in LA, Apple CEO Tim Cook will be interviewed by Kara Swisher and Walt Mossberg. Why is the iPhone not sold as a portfolio product? Meaning, why, after six years, is there no iPhone product range being updated on a regular basis. Having a portfolio strategy is not only followed by every phone vendor but also by Apple for all its other product lines, including the iPad, which came after the iPhone. In other words, please explain why the iPhone is anomalous from a product portfolio point of view. There are more than 800 operators world-wide so why are there only about 250 of them carrying your phone? Competitors large and small (from BlackBerry to Nokia to Samsung) have cited relationships with more than 500 operators so Apple is being uniquely selective. My question does not stem from a lack of patience: this total number of iPhone distributors has not increased markedly for over a year. Are you limiting distribution through conditions placed on operators (like the availability of sufficient quality data services) or are operators finding the distribution agreement too onerous (e.g. too high a minimum order quota)? In 2012 Apple’s capital spending has reached the extraordinary level of $10 billion/yr, higher than all but the most capital-intensive semiconductor manufacturers. 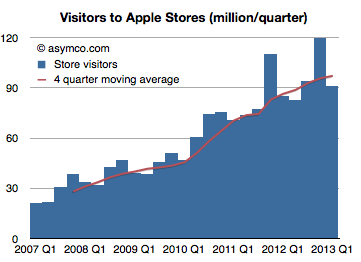 This is unusual for Apple as it was less than $1 billion in the year before the iPhone launched. It’s also unusual for Apple’s competitors in phones, PCs or tablets. It’s on a level matched only by semiconductor heavyweights. What is the purpose of this spending and what should we read into it leveling off at $10 billion for 2013? Depending on one supplier is an operational faux pas, and yet Apple has found itself in that situation with Samsung for mobile microprocessors. It may be excusable in PCs with Intel having an architectural monopoly but it’s not excusable for a chip that you designed yourself and purchase in massive quantities. Why did you give Samsung such a concession, especially knowing their potential as a competitor vis-à-vis alternative suppliers who had no such potential? Does the answer have something to do with the previous question? You can also get a free 30-day trial and bring back Cake Fridays here. via 5by5 | The Critical Path #85: Achilles' Heel. In the US, on a sales per square foot basis, Apple retail continues to perform twice as well as Tiffany & Co., the second best retailer, and three times as well as lululemon athletica, the third best retailer. The latest quarter showed a 7% growth in visitors and a new record revenue of $57.6 per visitor. 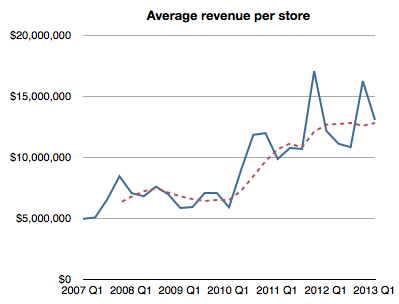 As a result, the average revenue per Apple store per quarter reached $13 million, the highest level for a non-holiday quarter. 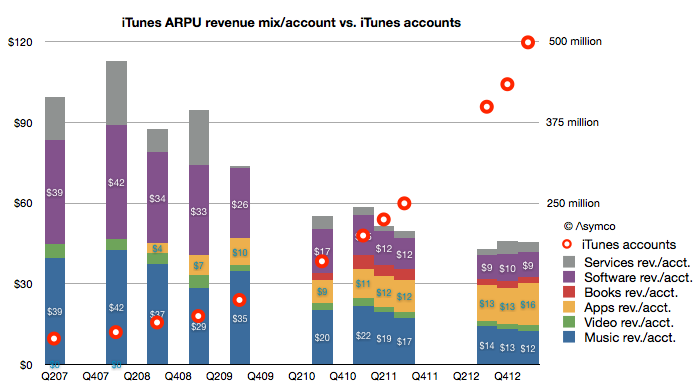 You can read each bar in the graph as the total “ARPU” or average revenue per iTunes user.